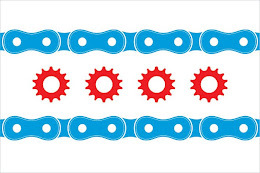 The Illinois Bicycle Lawyers at Keating Law Offices have been retained to represent a bicyclist who was a victim of a hit-and-run on August 7, 2012 at approximately 4:41 p.m. The bicycle accident occurred in Chicago at the intersection of Milwaukee and Giddings in the Jefferson Park neighborhood. We are seeking any and all help locating the person or persons responsible. According to 911 reports acquired as a part of the investigation, vehicles had pulled over to the right on Giddings to let a fire truck pass on its way to an emergency. However, instead of yielding, the driver of a dark-colored navy blue or black Toyota SUV took advantage of the situation and tried to "whip around" all of the stopped cars and blew through the stop sign on Giddings at Milwaukee. The Toyota SUV then directly struck the bicyclist in the intersection of Giddings and Milwaukee Avenue as the bicyclist proceeded down Milwaukee. As a result of this collision, the passenger side window of the Toyota SUV was broken. The Toyota SUV then fled east on Lawrence. The driver of the Toyota SUV was a male wearing a green shirt. If you have any information regarding this incident, please contact the Chicago Police Department or Keating Law Offices. The bicyclist, a college student from Massachusetts, suffered massive injuries including deep lacerations to his face that required reconstructive surgery. The attorneys at Keating Law Offices have worked with the Chicago Police Department to re-open the investigation as a part of the firm's complete investigation and pursuit of this claim.